Rita Morrison of Meigs County is seen with the 1967 Chevrolet Camero RS 327 she and her brother George Jr. bought to lift their spirits after the loss of their mother, Lois. Rita, who has lost count of how many shows the Camero has been entered in, said one of her favorite parts of showing the car is when a fascinated little one gets in behind the wheel. 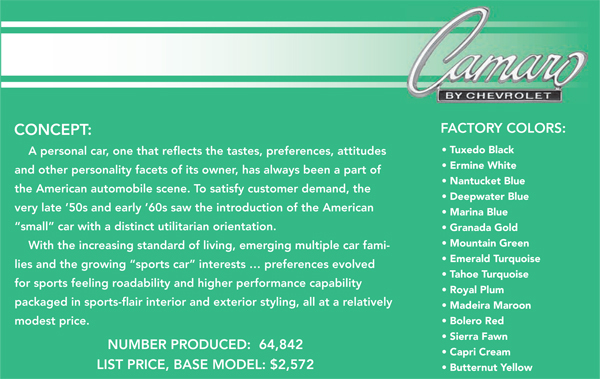 The Chevrolet Camero first went on sale Sept. 29, 1966, with the unveiling of the 1967 model year car. Chevrolet originally designed the Camero as a competitor to the Ford Mustang. Cars can mean a lot of things to a lot of people but classic cars almost always have some deeper special connection between owner and machine. For Meigs County residents Rita Morrison and her brother George Morrison Jr., their 1967 Chevrolet Camaro RS helps keep the memory of their late mother Lois alive. On Oct. 14, 2014, Lois Morrison lost a battle with kidney disease. Rita and George had taken it upon themselves as Lois’ caregiver as she battled and her death brought sorrow and also isolation for the siblings. That “something” came in the form of a 1967 Chevrolet Camaro RS that sports a stunning Rallye Green color. Taken against a blue sky background, there are few car-related scenes that can compare to the beauty of this beast with a true 327 engine. 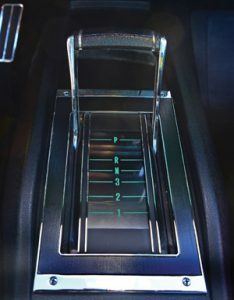 Instead of the original T shifter, the car sports a horseshoe out of a 1968 model. There are aspects of the car that aren’t stock to 1967 — including the color which debuted in 1969. The console should have a T shifter but instead sports a horseshoe out of a 1968 but otherwise the car is as it should be. Lois would have been proud. The car show crowd has helped Rita and George remember their mother by connecting with others. Although she couldn’t quote an exact number of shows they’ve entered, Rita said the car has earned awards at every one of those shows including one held on the anniversary of Lois’ death this past October in Glouster. The siblings first had their eye on a 1969 convertible but when they approached Cruisin Classics about the car, it still needed more work than what the two had hoped. Instead, they were shown this yet-to-be-detailed ’67 Chevy with the Rallye Green coat and their purchase became a no-brainer.